In a game that featured three surmounted deficits for the hosts, the Boston University men’s hockey team fell to #2 University of Massachusetts 7-5 at BU’s Agganis Arena on Friday night. 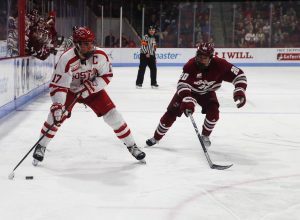 The Minutemen (20-5, 12-3 Hockey East) took no time taking a lead in the opening frame as senior forward Jacob Pritchard snuck in at the back post and knocked home a feed from sophomore forward John Leonard just 49 seconds into the game. It was the sixth consecutive game in which the Terriers (10-11-3, 8-6-2 Hockey East) conceded the game’s first goal. As alluded to by their coach, the Terriers did fight back. Awoken by the early UMass tally, BU temporarily tied the game six minutes in as senior forward Ryan Cloonan unleashed a laser into the top right corner off the pass from graduate forward Max Willman. After being kept off the scoreboard throughout the first half of the season, it was Cloonan’s second goal in as many weeks. 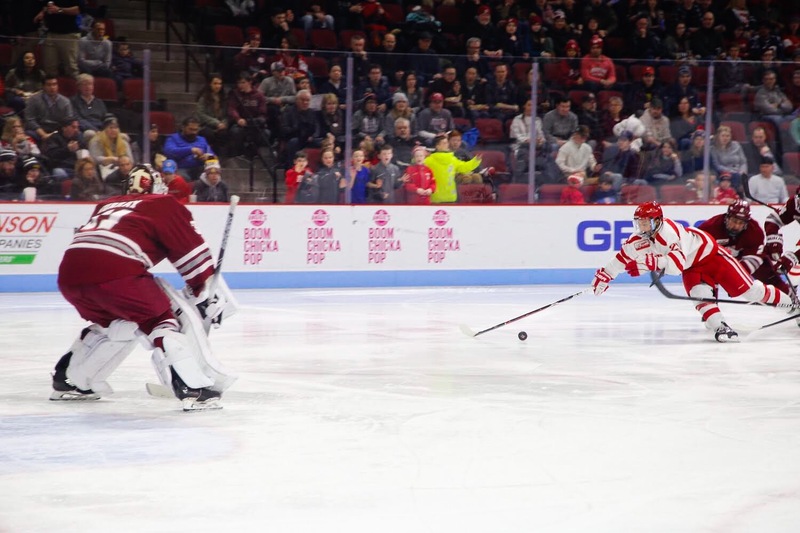 The Minuteman lead would be restored just two minutes later, as freshman forward Bobby Trivigno tipped in a shot from sophomore defenseman Cale Makar. The assist was the 30th point of Makar’s season, and the lone point of the night for the talented Canadian who has taken Hockey East by storm. [Makar] is about as good as anyone I’ve seen in this league in a long time,” commended BU’s O’Connell. With four minutes left in the period, freshman defenseman Marc Del Gaizo launched a seeing-eye rocket from the blue line, soaring through a crowd in front and into the BU net. The assist went to senior forward Kurt Keats, and the teams retreated to the locker rooms for the first intermission with UMass leading 3-1. “We kind of just took our foot off the gas at a few moments in the game,” said junior forward Patrick Curry in response to the Terriers giving up multiple goals in quick succession. Just past the halfway point of the middle stanza, it was BU who tilted the ice on the Minutemen. 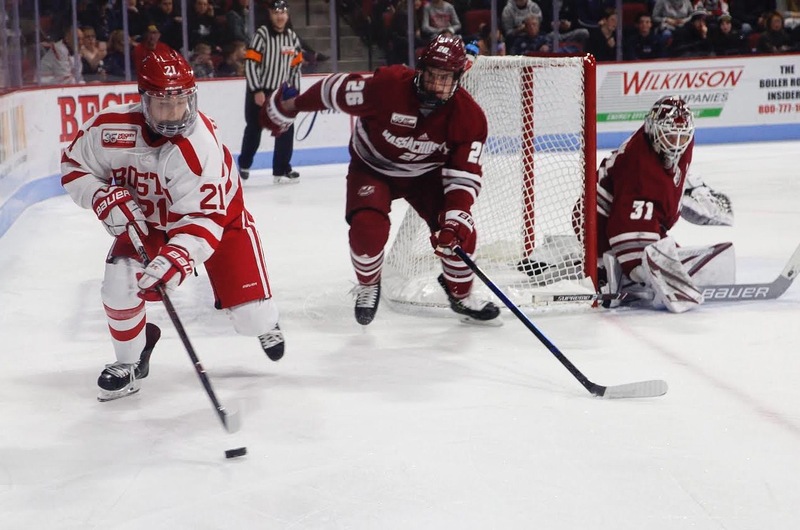 During a 5-on-3 power play, a centering pass from sophomore forward Ty Amonte trickled through the UMass crease, and it was freshman forward Joel Farabee there to sweep it in and give BU their second goal of the game. Farabee would be involved in BU’s third goal as well, flicking across a pinpoint pass to a wide-open Curry at the back post. The junior would make no mistake, tallying his eighth goal of the season and tying the game for the Terriers with less than five minutes to play in the period. BU’s joy would be short-lived, however, as the UMass regained the lead just a minute later. In a flurry in front, the puck fell kindly to sophomore forward Philip Lagunov, who buried it from just a few feet out. John Leonard was credited with the assist for his second of the night, and UMass had the one-goal lead going into the second intermission. Three and a half minutes into the third period, Patrick Curry added his second goal of the game to bring the Terriers even 4-4. A rebound fell to the junior, who slid it in with assists credited to sophomore defenseman Kasper Kotkansalo and Ty Amonte. “The compete level was there all night,” said Curry after the game. Once again though, the level scoreline would not stand for long, as freshman defenseman Ty Farmer benefitted from a convenient rebound at 8:49 off a shot from Bobby Trivigno to put the Minutemen up for good. “We just weren’t sharp at times defensively,” said Coach O’Connell. Farmer would fire in his second goal of the period on a breakaway inside of three minutes left to make the lead 6-4, but BU sophomore forward Logan Cockerill would reduce the advantage to one goal again less than a minute later. After Farabee came up empty on a one-on-one with the keeper, Cockerill came flying in for the rebound to get his fourth goal of the campaign. With the goalie pulled in search of a seventh, BU would surrender a breakaway to Leonard, leaving sophomore defenseman David Farrance no choice but to take the attacker down from behind. A goal would be awarded to Leonard in place of a penalty shot on an empty net, giving the sophomore a 3-point game, and UMass a two-goal cushion. There would be no last-second miracle for BU, and the game would finish 7-5 in favor of the Minutemen. 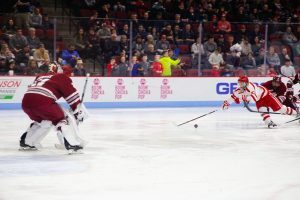 Jake Oettinger had 27 saves in the defeat for BU, and his skaters would be the first to admit that the junior netminder was left alone at times against a potent UMass attack. “We didn’t help Jake Oettinger out very much,” admitted Patrick Curry. Senior co-captain Bobo Carpenter was absent Friday against UMass, and may be unavailable for the first round of the Beanpot on Monday has well. “I think it’s like 50/50 right now,” shared Coach O’Connell. Despite missing their leading goal scorer in Carpenter, the first-year head coach was impressed with his team’s offensive output against the Minutemen. While a loss is never a result to be satisfied with, O’Connell was proud of his team’s effort against the second ranked team in college hockey. “It was a tight game from start to finish,” said the BU coach. The Terriers will now turn their attention to the Beanpot, which kicks off on Monday night at 8pm when BU will take on Northeastern in a rematch of last year’s championship game. Photos by the Boston Hockey Blog’s Emily Hunter. Now come the “Jake was great” comments. Can anyone see this goalie is sub average at best. And I realize that the D was awful. Oettinger can not catch a puck and can not stop action at his feet. Where is the coaching on this ? sorry to say, but all that is left of this season is an outside chance to win the Beanpot. other than that, there is no way in hell this inconsistent team can win the HE title and get in the NCAA’s. NO WAY! I have been a fan of BU hockey since before Colin was born. I am PO’d because I see a once great program become very average. This has happened to Wisconsin, Brown and to some degree Cornell. Now us. RIP BU’s great hockey tradition. What makes me really ticked off is the attitude of the coach. He NEVER gets mad. As someone who has coached many years teams take on the persona of its coach. Passive head coach. passive players. Terrible call do not even make him upset !!!!!. But, Colin say we are GREAT so I guess I should not comment any further. Can we stop all of the ridiculous talk about Oettinger being a great goalie please? The only ones who believe that are Sunshine Colin and the Dallas Stars. He had a huge opportunity on Friday to show us all what he can do. Granted, the defense let him down but he is just above average. It is time to really see what Purpura can do. They are going nowhere this year. The Eagles are still ahead in HE standings. Even a Beanpot win won’t take the tarnish off this mediocre season. TK out. C’mon now, did anyone really think we were going to beat UMASS? There’s a reason why they have been ranked #2 all season, they are good, VERY GOOD. They are big and strong, play physically all over the ice , have skilled forwards and have one of the best defenseman in the country. Still the Terriers played them toe to toe for most of the night, showing a tremendous fight until the latter stages. I thought it was a very entertaining game with up and down action in front of a bangout crowd. Now the Minutemen fans however are a bit obnoxious, but its their first trip to the high rankings so its understandable. This game was a good measuring stick to see where the Terriers are at and the verdict IMO is that they can play with the best , make a game of it, but are still lacking the leadership, experience, ect to be a national contender. 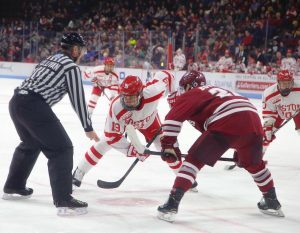 However that could improve and if they continue to show this determination in the upcoming games, and hopefully get Carpenter back they should do very well in the Beanpot, and I in fact predict a victory there. So when we are celebrating a week from Monday this loss won’t seem so bad. Tired of hearing we are going no where we are one spot out of the last home ice spot and just 3 points back of second place. I’m not saying we are going to win it all but we certainly have as good a shot as any other good team. We have played very good teams this year and we competed with them. That UMass team is the real deal and we played them tough. I have no idea where you come up with the traditions of bu winning are over just look at what we have done the last few years. This program is in great shape. You can knock the leadership the coaches me whoever you want but the simple fact is it won’t bother them or me because like the players I pour everything I have into this team I spend hours a day thinking about bu hockey and it’s not just October to April it’s all year. That’s how I know who we have on this team I know the dedication they put forth. Terrier for life.